SWOT Analysis Workshop – Annual Project or Service, estimated time to complete: 2 hours. The deliverable for a SWOT Analysis Workshop is four completed 10 point exercise sheets on the four aspects of SWOT analysis: Strengths, Weaknesses, Opportunities, and Threats. What is a SWOT Analysis Workshop? SWOT is a well-known tool of business strategy developed in the 1960’s. Applying general business perspectives will inform better IT strategy. 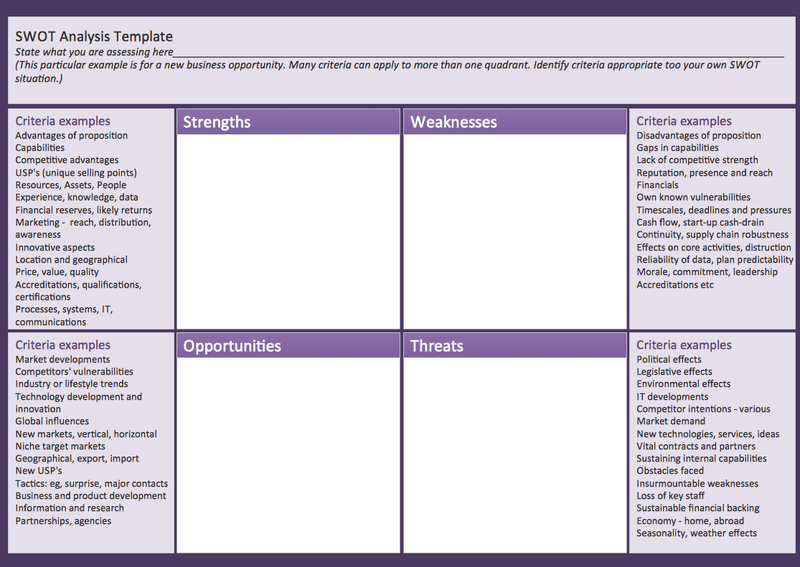 SWOT analysis – Strengths, Weaknesses, Opportunities, and Threats – is a classic business strategy creation tool. Using it in an IT context can reveal many business opportunities that can be exploited during the IT Planning Process, as well as bring to light potential threats. This proactive process makes issues more manageable, opportunities more evident and businesses more competitive. The strategic use of this exercise is that it enables an entity to uncover opportunities for success that were previously undiscovered or unarticulated. The SWOT Matrix is often used in the exercise and best presented on a whiteboard or presentation while feedback is given with post-it notes so that items can be fluid and moved around.